You’ve purchased a premium extension/plugin through our online store. The next step is to install it on your website. Before you begin please ensure you have the Gravity Forms and Gravity PDF plugins both active on your WordPress website. Done? Good! Now let’s get you up and running with your new premium plugin. Once you’ve completed your purchase you’ll receive an email containing a link to your plugin zip file – the email also contains your product key which will give you access to support and one-click updates: keep it safe! If your browser auto-extracts zip files when downloaded you’ll need to temporarily disable this functionality to prevent issues during installation. See how to disable this in Safari. Open the Shop Receipt email you received and locate the Your Purchases section. 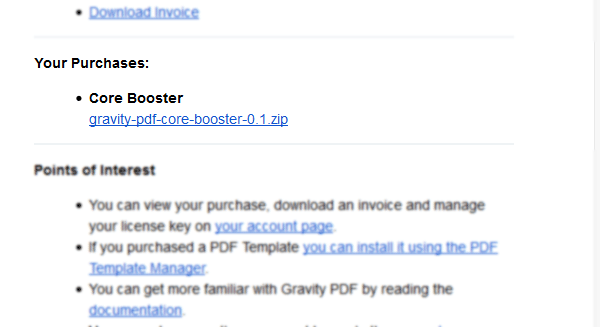 Click the link to download the plugin zip package. To enable one-click updates, locate the newly-installed plugin in the list and click the “Register your copy of PLUGIN_NAME” link. Enter then save your license key (found in your Receipt email). If the registration is successful a tick will be displayed next to the license. As long as you’ve registered your license key (as outlined in the Install Steps) and it’s still valid (all keys are valid for 12 months after purchase), your extension will periodically check GravityPDF.com for a new version. If there is a new version, it’ll be shown on the Dashboard Updates Screen or the Plugins page and you can one-click update the software.